Engaging and eclectic, the Mirari Brass Quintet brings a spirit of joyful collaboration and innovation to music spanning many centuries and genres. The commissioners of multiple new works for brass, the group performs a spectacular tight-rope act, balancing intensity with levity and refined virtuosity with pure fun. Now in its ninth season, Mirari has performed extensively across the United States, forging connections with audiences through lively and polished performances. The group has performed and presented outreach programs in 28 states on concert series presented by the Lakewood Cultural Center (CO), Fredericksburg Music Club (TX), the Manteca Kindred Arts Concert Association (CA), and Friends of Music at Emanuel (CT), as well as performing and having residencies at numerous universities, including Cincinnati Conservatory of Music, University of Tennessee at Knoxville, University of Kentucky, Cornell University, SUNY Potsdam’s Crane School of Music, and many more. The group recently made their first international trip to China, performing concerts and presenting educational outreach programs in Beijing, Haerbin, Dalian, and Chongqing! Since 2009, Mirari Brass has added nearly two dozen works to the brass quintet repertoire, with group members also contributing a number of arrangements and original compositions. Their debut album, Spires (2012), offers as its centerpiece Mirari’s commissioned work from Rome Prize winner and Guggenheim Fellow Eric Nathan, adventurously contextualized by works from the Renaissance and Baroque periods, as well as jazz standards re-imagined and transformed. in January 2018 Mirari released their second album, Renewed, Reused, and Recycled on Summit Records. The album is reflective of its title presenting mostly music that has been reimagined, refreshed, or rearranged for the Mirari Brass Quintet. The Mirari Brass Quintet showcases its passion for music education through master classes, clinics, and performances with students of all ages. All collegiate music professors, the quintet members relish extended time to interact with young musicians. Presenting clinics on topics such as Fearless Performance, Yoga for Musicians, and Creative Improvisation, the Mirari Brass Quintet examines all aspects of life as an artist and helps to foster the development of complete musicians. As a central tenet of the group, and by their name’s definition, all Mirari members share an admiration and respect for each other not only on stage and in music, but also in friendship. Mirari Brass is Alex Noppe and Matthew Vangjel (trumpets), Jessie Thoman (horn), Sarah Paradis (trombone), and Stephanie Frye (tuba). ​Matt Vangjel spent his childhood as a “military brat” moving frequently around the country, as well as abroad. He began his love affair with the trumpet at age 11. His dream has always been to tour the world as a performer so he is thrilled to be a member of the Mirari Brass Quintet! 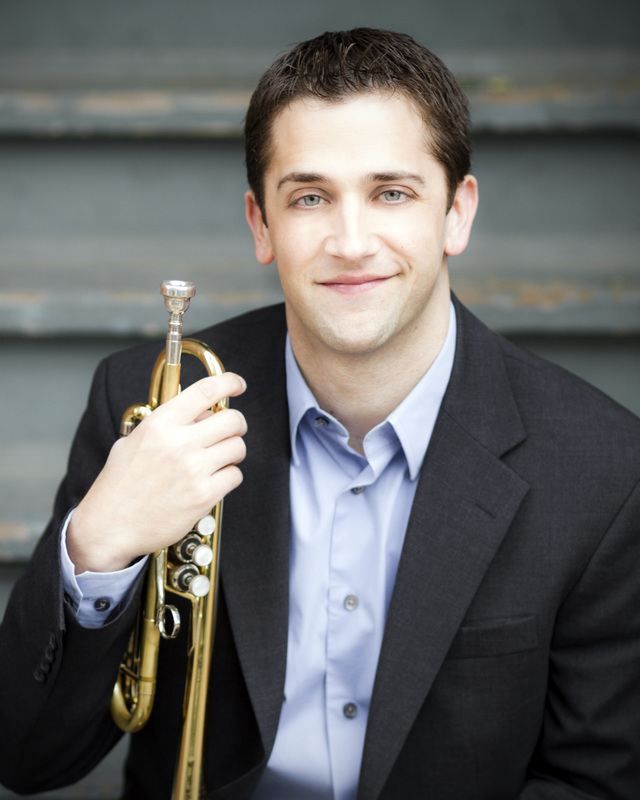 Currently, Matt is the Assistant Professor of Trumpet at Louisiana State University. Previously, he taught at the University of Arkansas-Fort Smith, Northwest Missouri State University, and as an adjunct instructor at the University of Missouri-Kansas City (UMKC). Matt earned performance degrees at UMKC (DMA) and the University of Michigan (MM). His bachelor’s degree is in Music Education from James Madison University in Harrisonburg, Virginia, and music education for all ages continues to be a significant and enriching part of his life. When he is not teaching, Matt is an active performer. He is a lover of all kinds of music and is thankful to have had opportunities to perform with Kansas City Symphony, Fort Smith Symphony, Jens Lindemann, Wycliffe Gordon, and Joe Burgstaller. He is also a long-time member of the internationally-acclaimed Fountain City Brass Band. On the rare occasions when he doesn’t have a trumpet in his hand, Matt is most likely outside playing some type of sport. University of Wisconsin-Madison. Alex has performed with the Charlotte Symphony, Lansing Symphony, Indianapolis Chamber Orchestra, Columbus Indiana Philharmonic, Shreveport Symphony, and many others. As a jazz player, he tours with the Louis Romanos Quartet and has played with the Indianapolis Jazz Orchestra and Hal Leonard Jazz Orchestra as well as summers at the University of Wisconsin-Green Bay Jazz Cam and as Director of Jazz for the Performing Arts Institute. Alex is also the group’s resident composer and arranger, having works premiered by the University of Michigan Jazz Ensemble and the Arbor Brass Choir as well. Alex has a Doctorate in Brass Pedagogy at Indiana University, where he studied with John Rommel and taught in the Jazz Department. Also receiving his Masters at Indiana University, he earned a dual degree in trumpet and jazz studies from the University of Michigan, studying with William Campbell and William Lucas. He has previously taught at the University of Louisiana-Monroe, Indiana State University and DePauw University, and has performed with Eric Alexander, Chris Potter, Hank Jones, the Count Basie Orchestra, Sylvia McNair, Five-By-Design, Jon Anderson, John Clayton, Leonard Slatkin, and Garrison Keillor. In the few moments when he isn’t thinking about music, Alex enjoys traveling, hiking, and most of all, Ultimate Frisbee! Visit Alex's website. Jessie Thoman is excited to be living a life in music! A lover of snow she is appropriately a native of Buffalo, New York. Jessie, the Associate Professor of Horn at the University of Tennessee Martin, has held principal and section positions in the Paducah Symphony Orchestra (KY), Columbus Indiana Philharmonic (IN), Terre Haute Symphony Orchestra (IN), Bloomington Symphony Orchestra (IN), Cardinal Stage Pit Orchestra (IN), Camerata Orchestra, Reno Jazz Orchestra (NV), Reno Pops Orchestra (NV), Reno Wind Symphony (NV), and the Reno Chamber Orchestra (NV). She has also performed in the horn sections of the Arkansas Symphony Orchestra (AR) and the Naples Philharmonic (FL). Jessie is a co-founder of the Mirari Brass and is thrilled to share the stage with four of her best friends! After finishing degrees at the Crane School of Music at SUNY Potsdam (BM), The Ohio State University (MM, MA) and Indiana University’s Jacobs School of Music (DM), she is now active as a teacher and performer. Along with winning positions in professional orchestras, Jessie also teaches, freelances, and has performed with artists like Jeff Nelsen, Andre Watts, Leonard Slatkin, Michel Camilo, Sylvia McNair, Eric Ruske, Maureen McGovern and the Count Basie Orchestra. 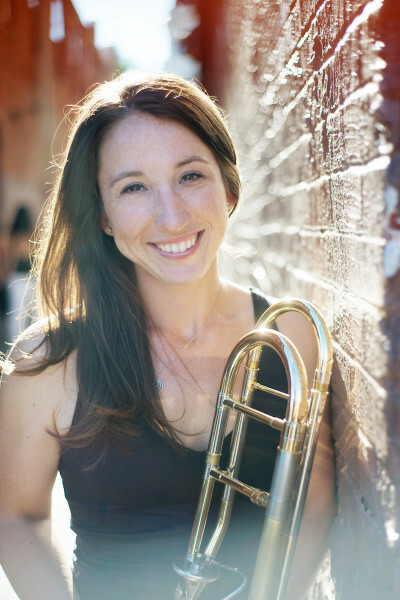 Jessie has been a featured artist at horn and brass days, and is active in presenting lectures, seminars, and workshops on Jeff Nelsen's Fearless Performance for Musicians concepts and Mindfulness at high schools and colleges all over the country. Known for her unabashed laugh (and lots of it) Jessie also loves singing and Broadway. Hailing from upstate New York, Sarah Paradis is the Assistant Professor of Trombone and Euphonium at Boise State University. Paradis earned her B.M. in Music Education from Ithaca College, and her M.M. in Trombone Performance from Indiana University, and her D.M. in Brass Pedagogy from Indiana University. Her primary teachers include Peter Ellefson, Carl Lenthe, M. Dee Stewart, Per Brevig, and Hal Reynolds. Paradis has held positions in the Richmond Symphony (IN), the Ohio Valley Symphony, and the Springfield Symphony (OH). She has also played with the West Virginia Symphony Orchestra, the Akron Symphony, the Lafayette Symphony, the Boise Philharmonic, and the Owensboro Orchestra. Paradis has performed at the Eastern Trombone Workshop, the International Tuba & Euphonium Conference, the International Trombone Festival, and the Women's Brass Conference. 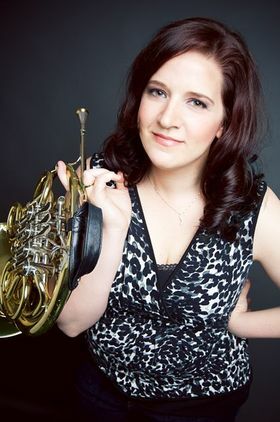 She has been a prizewinner in the Susan Slaughter Solo Competition in both 2010 and 2012, and was awarded the Trombone Fellowship at the Aspen Summer Music Festival in 2011. Paradis has instructed brass for the Bluecoats Drum and Bugle Corps, and she is a former member of the ten-time World Champion Drum and Bugle Corps, The Cadets. Paradis has held positions at Bemidji State University and Ohio University. She currently teaches trombone, euphonium, trombone choir, brass techniques, and chamber music at Boise State. She lives in Boise with her husband, Bill and their toddler, George. Visit Sarah's website. Originally from Birmingham, Michigan, Stephanie Frye is an active soloist, chamber musician, and orchestral performer across the country. She is currently on the faculty of East Tennessee State University, and previously held positions at University of Wisconsin-Platteville and Concordia University Wisconsin. Stephanie is a member of multiple chamber groups, has performed with the Milwaukee, Green Bay, La Crosse, Manitowoc and Fox Valley Symphony Orchestras. She has twice placed in the top three at international solo competitions. Stephanie has considerable experience teaching students of all ages. In addition to her work at ETSU she maintains a private low brass studio, has worked with the brass sections of multiple youth orchestras, has been the tuba instructor at the University of Wisconsin-Madison Summer Music Clinic for both middle and high school students, and for the past three summers was the tuba and euphonium instructor at Lutheran Summer Music in Decorah, Iowa. Stephanie received the Doctor of Musical Arts degree in Tuba Performance at UW-Madison. She also received her Masters degree in Tuba Performance in 2010 from UW-Madison and has two degrees (Tuba Performance and Biology) received from Lawrence University in 2008. In addition to the tuba, Stephanie’s interests and hobbies include running, cycling, hiking, backpacking and anything else that will put her in the great outdoors. Visit Stephanie's website.